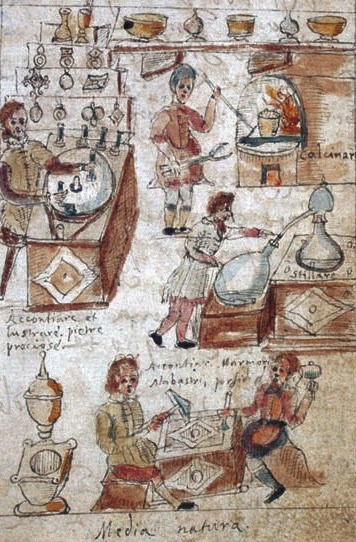 f. 7v, "Ars Preparatio Lapidum"
In the upper-left a lapidary works at a polishing wheel. It turns at low speed, driven by a belt which is powered from below, possibly by a foot pedal. The artisan holds two polishing fixtures against the surface of the disk, while four more stand at the end of the table. Under this workstation is an inscription in Italianate Latin that reads "Accontiare et lustrare pietre praciose" [preparing/dressing and polishing precious stones]. Behind the lapidary are shelves holding finished pieces. They range from small objects that appear to be rings, to cups, vessels and large bowls, presumably all made from stones, gems or minerals. Proceeding clockwise to the upper-right side of the image, we arrive at a worker tending a furnace with iron tools. Inside is a crucible sitting in the flames. Below is the firebox, and underneath that is the word "Calcinare" [calcination], which in Neri's parlance refers to the process of breaking down a material into a powder usually through the use of heat. Neri uses this method extensively in his glass formulations; in his book L'Arte Vetraria,  almost every colorant discussed is a metal which requires "calcination" before use in the glass melt. In the case of stone, Neri uses the furnace to make the main ingredient of glass. He breaks down quartz stones into powder by repeatedly heating them and then quenching in cold clean water. The rocks fracture into coarse granules which are then ground into a fine powder. The middle-right of the illustration shows a worker checking on a distilling apparatus. This consists of a small stove and three pieces of glassware. The "body" holding the raw material to be evaporated or sublimated is capped by a "head" that sports a long snout leading to a "receiver" vessel which collects the finished product. Stills were useful in producing everything from alcoholic spirits like grappa to acids and reagents. Their specific use in stonework is not clear, possibly in dissolving precious metals from the constituent minerals in stone. The lower-right portion of the image depicts two men seated at a low bench, each holding specialized tools used to shape "alabaster, marble and porphyry." Finally, in the lower-left we see a specialized mortar and pestle used to grind stone and minerals into a fine powder. The two benches and the distilling stove all bear a distinctive diamond shaped insignia with a small circle at its center. The two men in the lower portion of the illustration appear to be working on a stone inlay version of this same pattern. The implication is of an identifying symbol, but a specific affiliation is elusive. It seems well within the realm of possibility that Neri's illustration indeed depicts an early incarnation of the Opificio. The artisans working in Pietre dure were handling precious materials and as such might not be readily accessible to the general public. The fact that Antonio Neri's father was a prestigious member of the Medici royal court all but ensured his entree to the royal workshops.